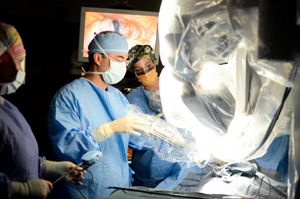 César Santiago, MD, positions the da Vinci® robot, assisted by Lisa Lockhart, SJB robotics program coordinator. Bay Care Medical Group is Tampa Bay's leading multi-specialty group with over 575 providers practicing in more than 190 locations in 46 specialties throughout 4 counties in the Tampa Bay area and central Florida. As part of BayCare Health System, the region's largest health care provider, we are comprised of a network of out-patient facilities, 14 hospitals, and services including imaging, lab, behavioral health and home health care. sports, schools and exceptional quality of life.